Studio City Residence — Paul San Gemino Architect, Inc.
With so many moving parts from design to construction, what is perfection in the office is subjected to the laws of reality during the construction process, often leaving a misalignment between intent and implementation. With the resultant disconnect between design and construction requiring mitigation it often takes a forensic effort to understand the existing condition and craft a new solution in the simplest and cost effective way, such is the story with this residential project. The story of this project begins with water infiltration. The front entry is defined by a pivot door. This contemporary design feature, while quite popular allowing for a continuous transition from exterior to interior material will not prevent water from infiltrating the interior of the home. Consideration of the design at the plane between interior and exterior should consider effective solutions to diverting water away from the vulnerable point of entry (typically done be sloping the exterior away from the home) and providing a system for moving water away more rapidly when the water volume exceeds normal conditions. Maintaining the same finish level between interior and exterior was the main concern of the client. To achieve this and provide a second method (first, slope patio away from building) water infiltration mitigation a trench drain was suggested at the exterior plane of the home. 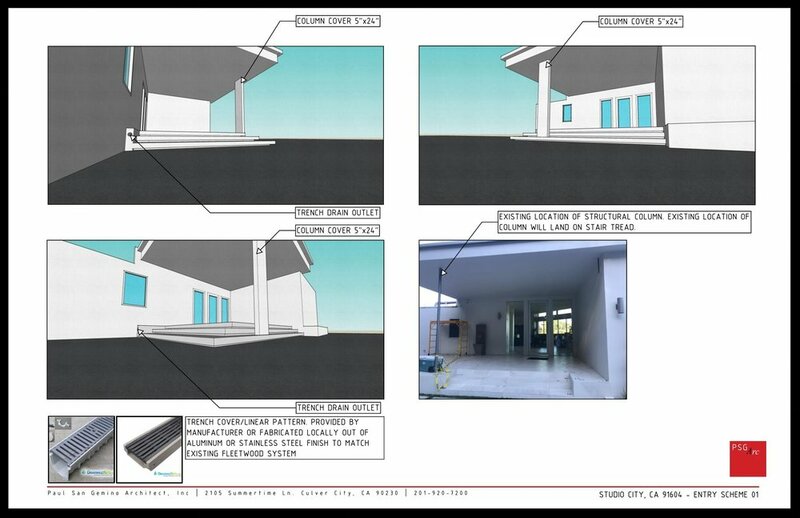 Asked to develop section details through the front entry, we worked with the manufacturers representative to understand the entry system and develop trench drain construction details allowing for the salvage of the existing pivot door and side lights. 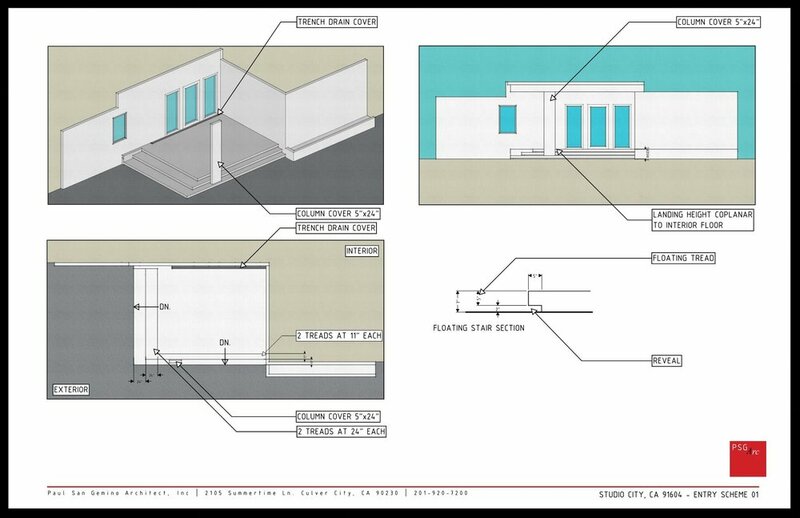 Concurrently, we developed a new design for the patio area at the entryway with the client showing the location of the trench drain, modifying the geometry to align with the canopy above, and cantilever element to the steps.